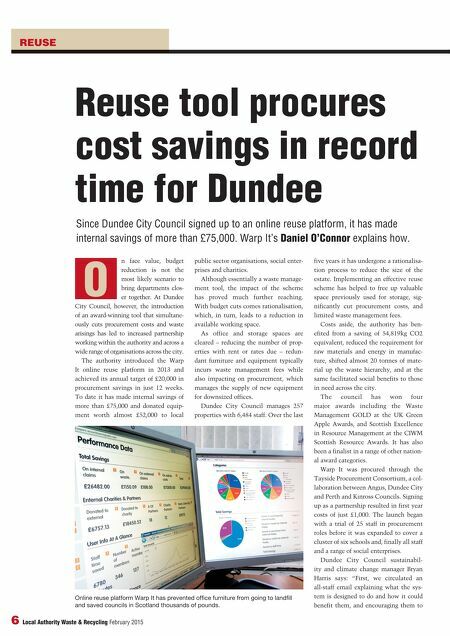 REUSE Reuse tool procures cost savings in record time for Dundee Since Dundee City Council signed up to an online reuse platform, it has made internal savings of more than £75,000. Warp It's Daniel O'Connor explains how. n face value, budget reduction is not the most likely scenario to bring departments clos- er together. At Dundee City Council, however, the introduction of an award-winning tool that simultane- ously cuts procurement costs and waste arisings has led to increased partnership working within the authority and across a wide range of organisations across the city. The authority introduced the Warp It online reuse platform in 2013 and achieved its annual target of £20,000 in procurement savings in just 12 weeks. To date it has made internal savings of more than £75,000 and donated equip- ment worth almost £52,000 to local public sector organisations, social enter- prises and charities. Although essentially a waste manage- ment tool, the impact of the scheme has proved much further reaching. With budget cuts comes rationalisation, which, in turn, leads to a reduction in available working space. 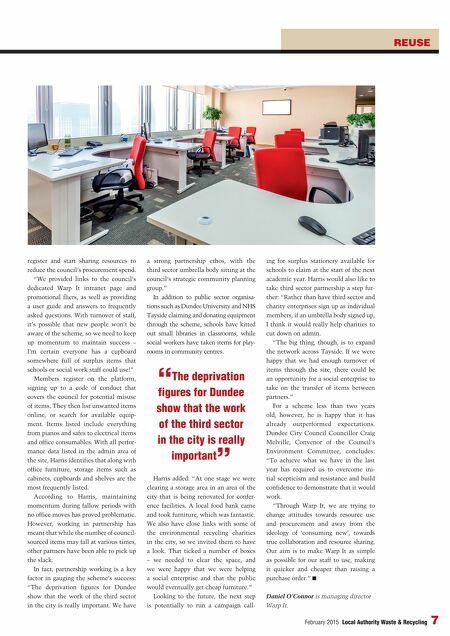 As office and storage spaces are cleared – reducing the number of prop- erties with rent or rates due – redun- dant furniture and equipment typically incurs waste management fees while also impacting on procurement, which manages the supply of new equipment for downsized offices. Dundee City Council manages 257 properties with 6,484 staff. Over the last five years it has undergone a rationalisa- tion process to reduce the size of the estate. Implementing an effective reuse scheme has helped to free up valuable space previously used for storage, sig- nificantly cut procurement costs, and limited waste management fees. Costs aside, the authority has ben- efited from a saving of 54,819kg CO2 equivalent, reduced the requirement for raw materials and energy in manufac- ture, shifted almost 20 tonnes of mate- rial up the waste hierarchy, and at the same facilitated social benefits to those in need across the city. The council has won four major awards including the Waste Management GOLD at the UK Green Apple Awards, and Scottish Excellence in Resource Management at the CIWM Scottish Resource Awards. It has also been a finalist in a range of other nation- al award categories. Warp It was procured through the Tayside Procurement Consortium, a col- laboration between Angus, Dundee City and Perth and Kinross Councils. Signing up as a partnership resulted in first year costs of just £1,000. The launch began with a trial of 25 staff in procurement roles before it was expanded to cover a cluster of six schools and, finally all staff and a range of social enterprises. Dundee City Council sustainabil- ity and climate change manager Bryan Harris says: "First, we circulated an all-staff email explaining what the sys- tem is designed to do and how it could benefit them, and encouraging them to 6 Local Authority Waste & Recycling February 2015 O Online reuse platform Warp It has prevented office furniture from going to landfill and saved councils in Scotland thousands of pounds.